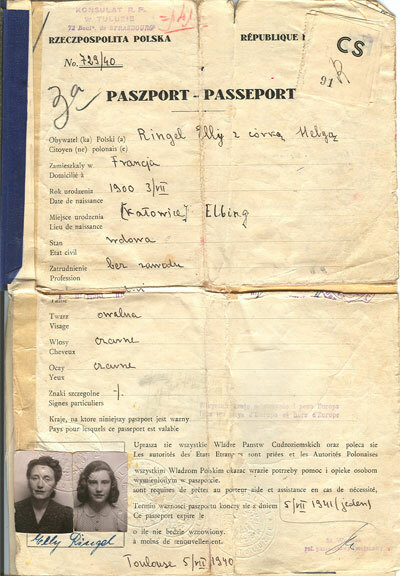 Valery Bazarov, the present-day historian at HIAS (Hebrew Immigrant Aid Society), the international refugee agency that helped Elli, Hilda, and Helga at several points in their three year long oddessey across France and Portugal to the safety of America, offered to look in the organization's archives in New York to see what they have on their case. Valery informed me that HIAS was very active in southern France from the time of the fall of Paris to the Nazis in June 1940 until the German occupation of southern France in November 1942--helping thousands of Jews escape the Nazis including prominent people like Marc Chagall --and therefore might be able to determine whether the organization helped them there as well as in Portugal and New York. 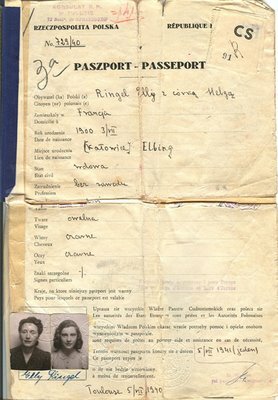 As we know, Elli and Helga had obtained fake Polish passports that must have listed Elli's borthplace as Kattovice--perhaps the 3.7.900 refers to Elli's birthday in 1900 (the correct year of her birth. The address is clearly where they lived in Lisbon. The second document was issued by HIAS upon their arrival in New York on Aopril 23,1941. It gives us the important information that the ship they arrived on was the S.S. Guine, a Portuguese ship that Bazarov said was one of the main ships that carried refugees from Lisbon to New York during those years. It lists Elly as a widow 40 years of age of Polish nationality and Helga as being 15 (actually she was 16). It lists their residency as Hotel Paris in New York, which was probably where Elli and Hilda stayed during the week that they spent in New York (Helga was held on Ellis Island during that period) connecting with Judge Ringel who apparently signed on as their guarator in New York even though he had never met them before and there was no discernable family connection. All of that was arranged through the aegis of HIAS. so it is a great shame that the file has been lost. It lists the HIAS worker who dealt with their case as Neubau (the first name is indistinct), who Valery said was a well known HIAS worker during those days and had the distinction of handling the very last immigrant held on Ellis Island when that facililty closed in 1954. Bazarov urged me to check with the office of the former Immigration and Naturalization Service in Washington (now under Homeland Security) which likely has records from Elli, Hilda and Helga's arrival, which would shed light on how they managed to get permission to come back to the U.S. as permanent residents after travelling to Cuba from New York. The HIAS form lists them as "in transit to Ecuador" and specifies that they arrived in New York on "4/23-bonds to 5/10", apparently they would have to leave by May 10. I am going to have to rewrite some of the Ruby Family History account on all of this as in our last interview, Helga spoke of travelling on visas to Costa Rica, not Ecuador, and although she had previously spoken of Ecuador as the country whose visas they had purchased in France, thus allowing them to travel to Portugal and on to the Western Hemisphere, I went with the Costa Rican story in the RFH. After leaving HIAS I went to the National Archives Research Administration in lower Manhattan--I had to research another person for an article I am writing about claims that Pope Pius XII supposedly helped 800 Jews and 11 nuns cross the ocean from Portugal to the US--also in 1941--and unfortunately was unable to find confirmation of that claim. That story and another one I have been working on re Pius and the Jews has turned out to be a wild goose chase that has taken way too much of my time over the past several weeks. But I did use the opportunity to find confirmation of Elli and Helga's arrival on microfilm. There was also a notation that Helga was naturalized (received U.S. citizenship) on June 2, 1947, only a week or two before she and Stan got married (Dan, Jo, what was their anniversary--I seem to remember June 9 or 11)? The office closed before I could secure Helga's naturalization (citizenship) papers, which Dan and Joanne were unable to find in their treasure trove of documents they discovered in Helga and Stan's attic last year, so now at last we will get it back. Nice work, Walter. Too bad the full file is missing, but it is great that you found those records. The visa information and Ecuador story are consistent with the stamps in Elly's passport, which we have. 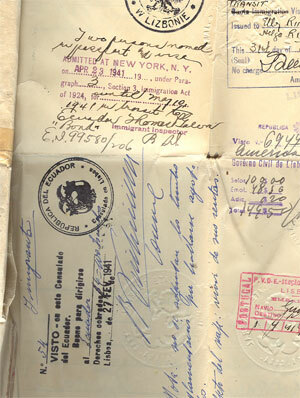 Here is a page with a stamp for the transit visa in New York and a visa issued in Lisbon for Ecuador. I don't see anything that shows they actually went to either Ecuador or Costa Rica. The next stamp (on the next page) is from the Cuban consulate in Nueva York, dated May 7, following a notation about a payment of $500 per person. 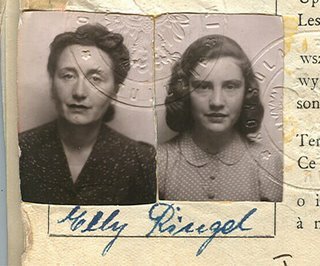 Following that are two U.S. immigration visas issued to Elly and Helga on May 21, 1941, by the U.S. Consul in Havana. Finally, there are U.S. Immigration and Natularization Service stamps noting their arrival in Miami on May 23. Dan gave me the password to Ancestry.com and showed me around a little bit, and I managed to make a few findings from the census. The 1900 census lists the arrival date of Abraham and Rose Ratner in America as 1890 (whereas the 1930 census says 1891). Assuming that one or the other is correct it solves the Ellis Island mystery--they arrived shortly before the opening of the Island on January 1, 1892 and were probably processed in the barge office that served as the site between the closing of Castle Garden on April 18, 1890 and the opening of Ellis Island. We see from that census that their oldest child was Peyzer born 1891 followed by Hyman (George?) 1892 and Lillie (probably Til ) 1896 and Sadie (clearly Selma) 1899 and Dora born 1900, who probably died soon thereafter. At that time they lived at 42 Broad Street, are renting their house and Abe is already listed as a soda water manufacturer. The 1930 census, by the way, has Abe, Rose and Thelma (Til) at 16 Cuyler Ave, which has a net worth of $14,000 and mentiones that they own a radio set (one of the few on the this page of the survey to do so). Amazing stuff. Well, lets collect a lot more of this stuff before I get back to revising the Ruby Family Histories. A couple of days ago, Walter posted about HIAS and Helga and Elly's arrival in New York. He mentioned a scrap of paper with a birth date and birth place, and he surmised these would have been taken from Elly's false Polish passport. We have that passport among our artifacts, and Walter is precisely correct about Katowice and the July 3, 1900 date--the place is fictitious but the date is accurate. Actually, there is a discrepancy regarding Elly's birth year in the two official death records that are accessible through Ancestry.com. The Social Security Death Record has her date of birth as July 3, 1900, but the State of California death record has it as July 3, 1901. We agree that 1900 is correct, right? Here's an image from the passpost, followed by a closeup of the passport photos.